In recent years, there has been a remarkable revival and interest in the traditional art form of Suzani textiles. Suzani comes from the Persian word for "needle", and it specifically refers to exquisite silk thread embroidery panels made by women of Central Asia. In particular, it originated in the area today known as Uzbekistan along the Silk Roads that interconnected the cultures of Europe, Turkey, and China with the Muslim world. Suzani textiles usually have a cotton (sometimes silk) fabric base, and which is embroidered in a silk or cotton thread. The designs are deeply rooted in tradition with popular motifs, such as sun or moon disks, flowers (tulips, carnations, and irises), leaves and vines, fruits (especially pomegrantes), and occasional birds and fish. The embroidery is generally in delicate shades and natural dyes, such as muted indigos, cochineal and madder for red and rust, saffron from the wild crocus for yellow, and pomegranate skins or pistachio galls with iron for black. 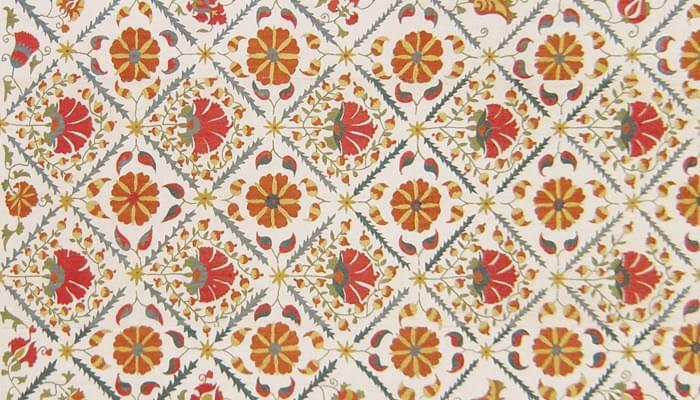 Traditionally most Suzani textiles were woven at home, and it was rarely the embroiderer herself who sketched the design. Most commonly, when a daughter's dowry was being prepared, fabric would be taken to an older woman or a village elder who acted as the local designer. The fabric would then be divided typically into four to six strips, and each strip was worked by different members of the family. As a result, the patterns of the Suzani can appear slightly misaligned or asymmetrical, and it is not uncommon for shades of color to vary from one strip to the next, for no two batches of natural dye come out exactly the same (namely Abrash). Detail of an iris flower in a cochineal rust dye.